The WITTMANN Group has launched its long awaited W822 robot model. The W822 will now serve as the entry model for small to mid-size plastics molding operations that can involve significant degrees of complexity such as handling higher payload and carrying out mold insert work. The chief technical difference of the new W822 within the W82x series of robots is a rack and pinion drive for the vertical axis. The W822 can thereby handle 15 kg of payload on strokes of either 1,000 mm or 1,200 mm and 12 kg when fitted with the 1,400 mm axis option. In many other respects the W822 provides the same mechanical dimensions as the well-proven W821 model. A horizontal axis of up to 4,000 mm is possible and the W822 can be fitted with numerous automation features from the WITTMANN automation stable, such as servo rotational axes, spare I/O-modules and vacuum and gripper circuits. WITTMANN has developed and launched the W822 in response to molder needs for greater payload and versatility around small to mid-sized molding machines of up to 400 tons of clamping force. Thus far the entry level robot for insert application work has been the W832 robot. This model however has generally reckoned to be oversized on molding machines of less than 200 ton clamping force. The W822 robot now allows users a superior automation performance around the small and mid-size molding machine range. 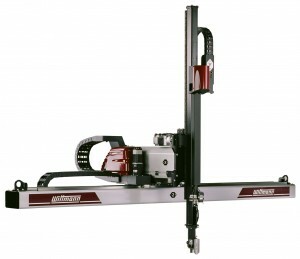 The W822 comes as standard with the universal R8.2 robot control from WITTMANN. This includes real-time functions such as SmartRemoval, EcoMode, intelligent vacuum systems with teachable switchover levels, SoftTorque and many other advanced features. All related and attached downstream molding operations can also be easily accessed through the R8.2 control for a single point of control. Martin Stammhammer, Sales Manager Robots and Automation Systems says that “the W822 robot is the latest in a comprehensive revamp of our WITTMANN automation range. Much of this work has been inspired by an increased customer need for more automation performance beside-the-press – increased payload, performance and flexibility. Customers visiting the Fakuma 2012 exhibition, October 16–20 in Friedrichshafen, Germany will be able to sample WITTMANN’s new robot models at first hand. WITTMANN will also be communicating its new work in IML technology (In-Mold Labeling) and also in its new innovations in dynamic and adaptive drive control. 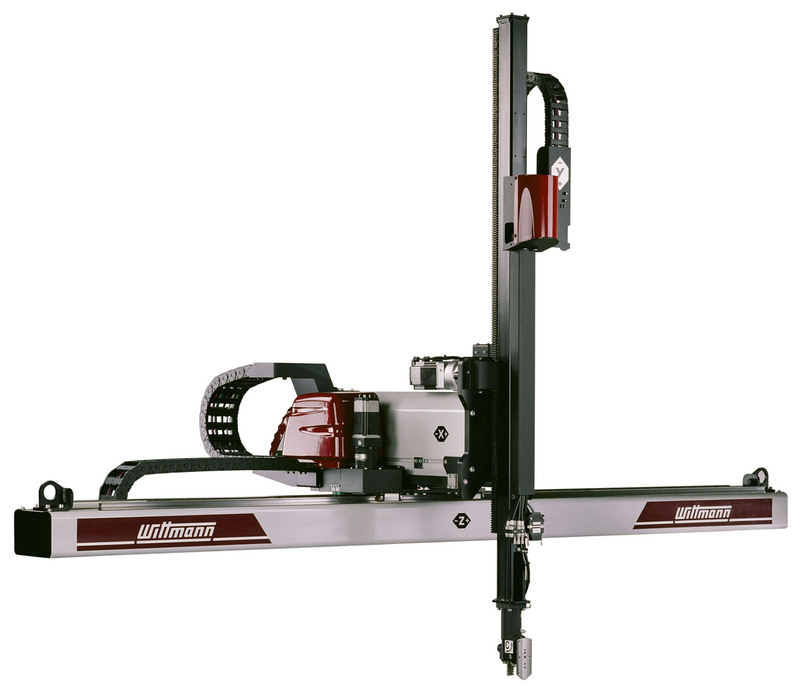 WITTMANN worldwide is one of the leading manufacturers of robots and peripheral equipment for the plastics industry. The WITTMANN group with Headquarters in Vienna/Austria is a worldwide operating company with 7 production facilities and 20 branch offices in all major plastics markets in the world. WITTMANN’s product range includes robots and automation systems, automatic material handling with dryers and plastic recycling, temperature controllers and chillers for machine tools and volumetric and gravimetric blenders. With this comprehensive range of peripheral equipment, WITTMANN can provide processors of plastics with total solutions which cover all their requirements, ranging from autonomous work cells with single zone temperature controllers, screenless granulators, sprue pickers, integrated vacuum loading systems and integrated cross-linked control systems with integrated material loading and dryers to automated robotic systems for flexible finishing of semi-finished injection molded parts. On April 1st, 2008 WITTMANN took over the BATTENFELD Kunststoffmaschinen GmbH at Kottingbrunn (Lower Austria). There will continue to be independent growth in the market for auxiliary equipment on one hand and for injection molding machines by BATTENFELD on the other. However, the syndication will lead to connectivity between both product lines, providing the advantage plastics processors have been looking for in terms of a seamless combination of processing machines, automation and auxiliary equipment – all occurring at a progressive rate.